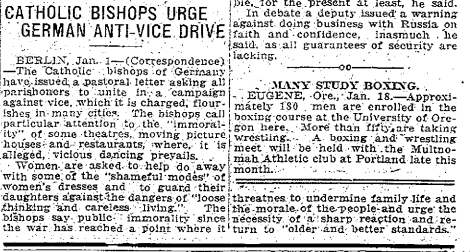 BERLIN, Jan. 1 — (Correspondence) — The Catholic bishops of Germany have issued a pastoral letter asking all parishoners to unite in a campaign against vice, which it is charged, flourishes in many cities. The bishops call particular attention to the “immorality” of some theatres, moving picture houses and restaurants, where, it is alleged, vicious dancing prevails. This will either make you mad or glad — it all depends. 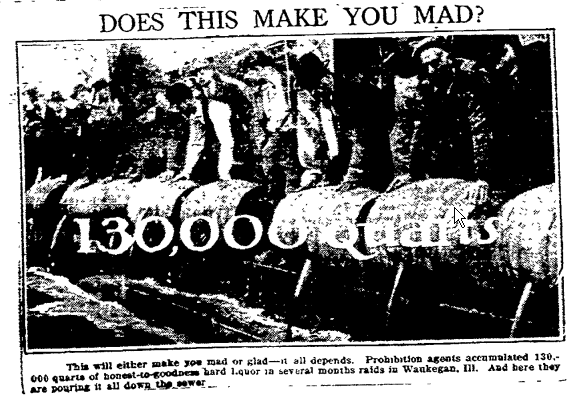 Prohibition agents accumulated 130,000 quarts of honest-to-goodness hard Liquor in several months raids in Wankegan, Ill. And here they are pouring it all down the sewer. 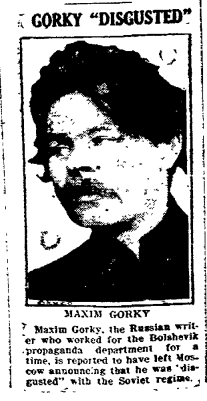 Maxim Gorky, the Russian writer who worked for the Bolshevik propaganda department for a time, is reported to have left Moscow announcing that he was “disgusted” with the Soviet regime. Western societies really were unbelievably conservative – post-Victorian, let us say – in those dim and distant days long since past, weren’t they. My 91 year old paternal grandmother, who’s still alive and was the youngest of my grandparents, would have been a year-and-a-half old when these articles were published. Absolutely fascinating stuff. Though I’m glad I didn’t live in that era.